The Garden Post is an email newsletter that talks about what is going on in your garden and at your garden center. We hope you will stay connected with us! Wander down the curving paths. You’ll see some familiar shrubs and some others you’ve probably never seen before. Showing you how best to use them in your yard is what we do. Look at the display gardens and steal an idea to use at home. Bring your questions to our experienced staff. If an employee can’t help you, they’ll find someone who can. At Ken Matthews Garden Center, plants are what we do. 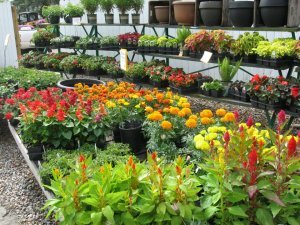 We carry over 500 varieties of shrubs and trees – and over 1000 varieties of annuals and perennials. In addition, we stock hundreds of houseplants, bulbs, water plants, vines, and vegetables and herbs. Not only will you find a unique selection of plants at Ken Matthews Garden Center but you will also find quality products. Deliveries are made consistently at the nursery so ensure the plants are the best you will find anywhere. We invite you to stop in and see the unique selection of plants that Ken Matthews Garden Center has to offer. Notice also the paver patios and dry stack stone walls. These can be a DIY project or we can build it for you. Since the early 1970’s providing landscaping and grounds maintenance services to customers on the Virginia Peninsula and Middle Peninsula. Spring Blooming Perennial Sale this Weekend! Comments Off on Spring Blooming Perennial Sale this Weekend!